GRAFENWOEHR, Germany — Moving to a new city is always a challenge. Packing, unpacking, and then trying to find a hockey league. You have to see where the league is at, what level you can play at, and if a local team has a spot for you. You might be able to do that with ease in the U.S., but try doing this overseas in a country where English is not the native language. Such is the case for the U.S. Service members stationed in Germany. Despite these challenges, there is a group of players in Germany who successfully combine their love of hockey and overseas duty to their country. They are the Bayern Rangers Ice Hockey Team. The players are U.S. Soldiers and DOD civilians from the Grafenwoehr, Vilseck, Hohenfels and Ansbach military communities. Most of the team’s players are combat veterans who recently served in Iraq and Afghanistan. The Bayern Rangers were created in 2009 to represent U.S. Forces here in Bavaria, Germany, at club and military hockey tournaments throughout Europe. The highlight for the team is the yearly military ice hockey championships in Europe championships held in the Olympic Stadium in Garmisch-Partenkirchen, Germany. This historic rink hosted the 1937 winter games, and in February will host the 24th annual USAFE Military Ice Hockey Championships. Huestis coached a local German youth hockey team in Weiden, and saw the opportunity to form a U.S. military team to play local German clubs and compete in the annual military tournament in Garmisch. “We created the team in November 2009, threw our helmet into the tournament and then started to recruit players. We had about two or three team practices and then played in the tournament,” said Huestis. 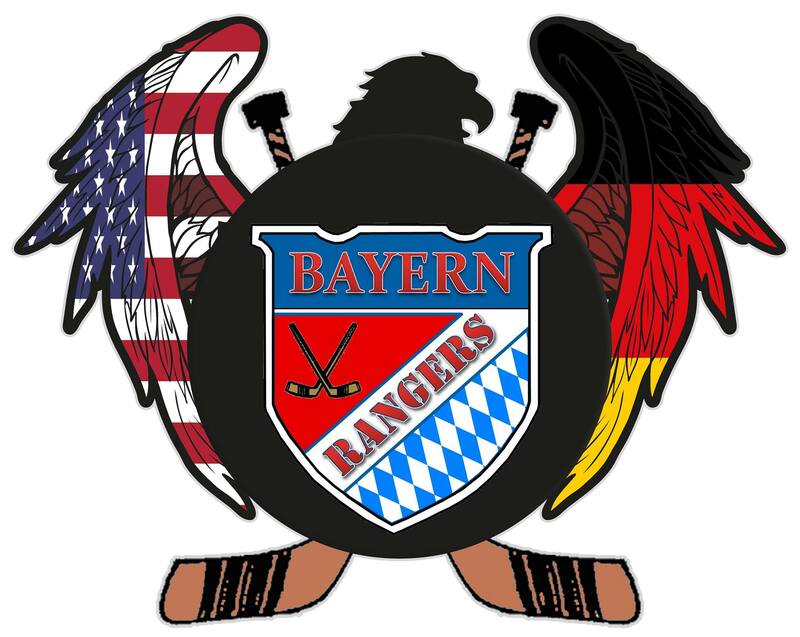 At the first team meeting, CPT Adam Sperry, a life-long New York Rangers fan, suggested the name Bayern Rangers. Bayern is German for Bavaria. Rangers are elite U.S. Army infantrymen. Most of the team had joined the Army after Sept. 11 and thought that Lady Liberty was a great, patriotic symbol for the new U.S. Army team. So, it made complete sense for that first year team to wear the New York Rangers “Lady Liberty” third jersey. The inaugural team ended up in fourth place out eight teams in the 18th Annual USAFE Ice Hockey Tournament, finishing behind the Kaiserslautern Military Community Eagles, the Geilenkirchen (Canada) Flyers and the Aviano (Italy) Dragons. In 2011, a new jersey was made because the NY Rangers third jersey was no longer being produced. The new jersey incorporated the Bayern name and parts the Bayern State flag, along with a black and gold “U.S. Army” tab over the player’s heart. In the 19th Annual USAFE Tournament, the team won the bronze medal, finishing third out of 10 military teams. The Bayern Rangers defeated the Aviano Dragons, the Baden Bruins and the Stuttgart Mustangs. The team’s success was especially sweet for two Ranger players, Maj. Mick Minetti and Capt. Matt Donofrio, who traveled from Afghanistan on leave to complete in the USAFE Ice Hockey Championships. Over the years the early success continued, in the 20th and 21st annual tournaments the Rangers qualified for the semi-finals each year. In 2014, the Rangers finished first of 12 teams as the champions of the 22nd annual European military championships. Last year, as defending champions the Rangers fell to the KMC Eagles in the championship game. Playing for the Rangers brings far more than medals. “It is also great physical training for those of us that play. Getting on the ice for an hour or hour and a half is like running five miles, and for us Rangers it is like 10 miles due to the hard work we put out there on the ice,” said SPC Sean Foley, a skilled Bayern Ranger forward, stationed in Grafenwoehr with the 15th Engineer Battalion. To those of us, who are stationed in another country far away from friends and family, this team has become our overseas family. We share a love of country, a dedication to duty, and a passion for playing ice hockey. Story contributed by CW4 Kyle Hernandez.